100 chronicles the last three months of a cancer stricken woman who has a list of things to do before she dies. Her list of tasks, mostly closures and practical undertakings, expands to the worldly and the spiritual as people close to her share her last days. The film examines the betrayal of the body, celebrates the senses and contemplates the end of life and how to live it. 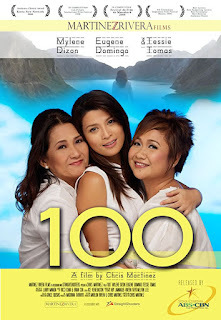 100 is a 2008 Filipino film starring Mylene Dizon who portrays the role of a woman terminally-ill with cancer and had about 100 days or about three months to live. She set for herself various tasks to accomplish in her final days. The film was written and directed by Chris Martinez.